This is Delilah, also known as Bun-Bun, when she was a young cat. 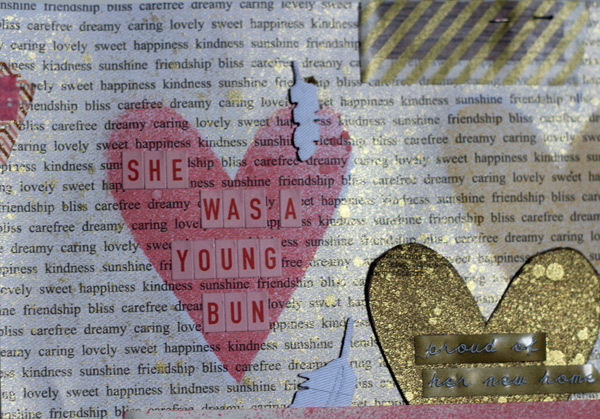 The title, "she was a young Bun" was inspired by something very odd and funny my graduate supervisor said one day. We were sitting in the lunchroom, which was on the 5th floor and had two full walls of windows, when a bird landed on the window sill and hopped along. After a minute, it flew off, and my supervisor announced with great gusto, "I believe that was a young bird", which you may or may not find humorous, but said in a British accent, is actually quite funny. :) The phrase, "I believe it was a young ____" quickly became a family favourite, and we often spy young things wherever we go. 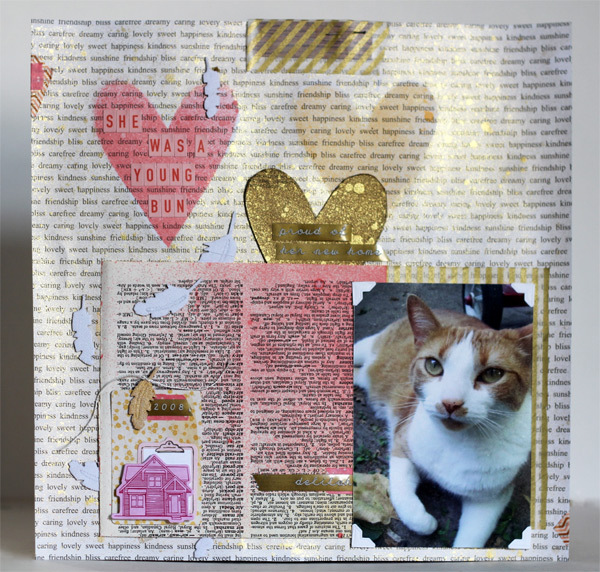 I used my new Heidi Swapp gold lame color shine for the first time on this page, and I LOVE it! It adds such a nice gold shimmer, but it isn't flashy and it doesn't have any multi-coloured undertones like irridescent sprays usually do. I can see I will definitely be using this one a lot. I make the background, I used a stencil that I cut, and sprayed the hearts pink and yellow, first. Then I masked off the hearts and sprayed the background with gold lame. I adore these October Afternoon Midway Mini Market stickers. I have already used up most of one sheet and have purchased another. I think this is the first time I have ever bought a second set of letter stickers! Here you can really see how gold and shiny the gold Color Shine is. 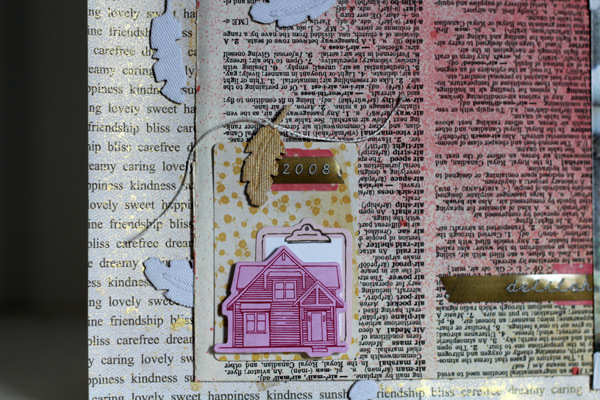 I sprinkled some Studio Calico mistable fabric feather stickers down the page, like it was a feather falling down through the air. For the feather layered over the Dear Lizzy 5th & Frolic die cuts, I painted gold lame Color Shine onto it with a paint brush. I used a few layers so it would be very gold, with nice even coverage. I absolutely adore these super wide washi tapes. I love layering tapes; here I used a wide woodgrain under wide gold airmail stripe. I love that most washis are slightly transparent, which makes them great for either building up layers for opacity, or for layering over something else to create a nice subtle effect. the perfect blend of distress and shine! Love it! this is so pretty- i just bought some of the heidi swapp sprays but i havent opened them up yet! can't wait to play with them!! thanks for stopping by my blog today and taking the time to write such a kind comment! Really loving that spray and I love your layout! Awesome page! 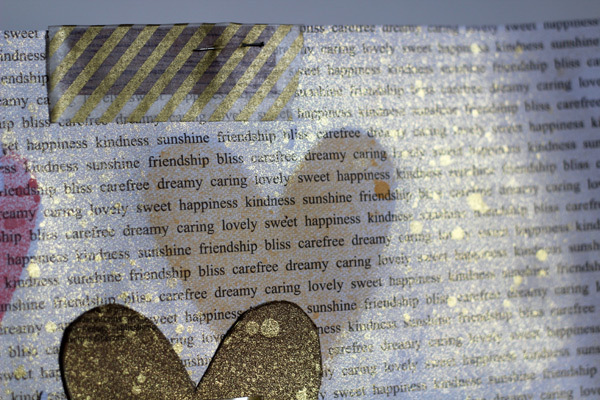 I like the book text and the shine. This is great. I have three Heidi Swapp sprays, but haven't tried them on a project yet. Will have to set them out to remind me. Such a pretty page! Love the gold washi and those feathers are cool. Fun stuff!